Deep in the Indian jungle, a family of wolves rescue a 'man-cub' - a human boy - from being eaten by the fearsome tiger Shere Khan. They name the boy Mowgli, and raise him as one of their own. 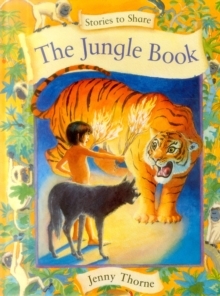 Mowgli is tutored in the ways of the wild by Baloo the bear and Bagheera the panther - who need help from Chil the hawk and the giant snake Kaa when the man-cub is captured by a troop of mischief-making monkeys...The timeless tale is retold for a new generation in this engaging book, which is enlivened by detailed illustrations throughout. It is ideal for reading aloud to small children, or for more confident readers to enjoy by themselves. They will be captivated by this really big adventure!